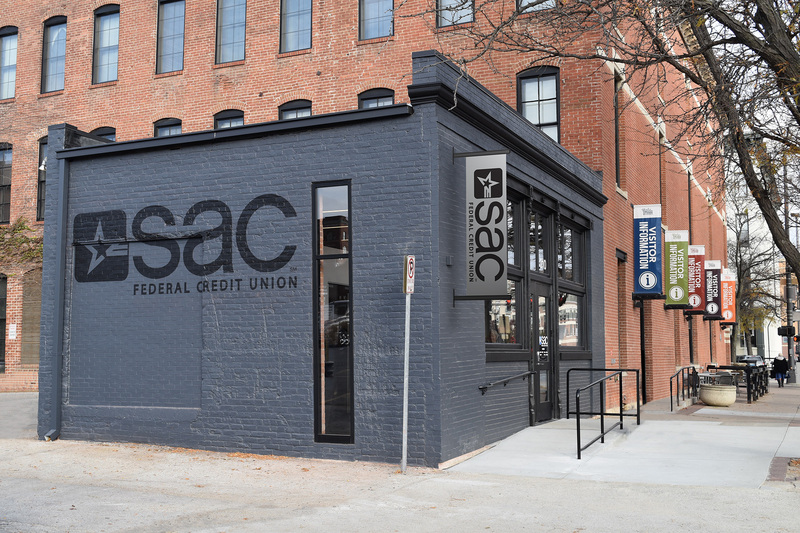 SAC Federal Credit Union opens branch-of-the future in historic Old Market. SAC Federal Credit Union has announced that it has opened its 23rd branch in Omaha’s Old Market. The building where the new branch is located, is on the National Register of Historic Places and is in the Poppleton block of the Old Market. The new branch is a different style for the credit union, in that it is a “cashless branch.” The full service branch employs 3 employees and features an ATM as well as an ITM or Interactive Teller Machine. The new branch is “really a branch of the future,” says Robin Larsen, Chief Operations Officer for the Credit Union. “What we’ve done is taken a historical building and made it modern.” The employees at the new branch are able to assist members with all the services of a standard branch, from checking and credit cards to lending needs. The Credit Union had been looking for a location downtown for some time. “The convenience of our members is important to us, with so many members who work, live and are visiting downtown Omaha every day, this location was the perfect site for our new branch,” said Gail DeBoer, SAC FCU President and CEO. SAC worked with their architect (HDR), designer (AOI) contractor (MCL) and city historical representatives to incorporate the historical significance of the space into the new design and preserve as much of the original history as possible. The new SAC Federal Credit Union branch is located at 310 S. 10th St., south of the Omaha Visitors Center. The branch hours are Monday – Friday, 8:30 am-5:30 pm, and Saturday, 9 am-Noon. SAC Federal Credit Union is Nebraska’s largest locally owned credit union and has been serving the Greater Omaha area for over 71 years. In addition to a full line of personal and business banking products, SAC offers better banking for life, helping members with home buying, investment education, retirement planning and more. SAC has 23 convenient locations to serve its members, and membership is free and open to all residents in SAC’s 8 county service area. http://www.sacfcu.com.